june 12, 2000. I am a native San Franciscan. I grew up in the Excelsior district, but I was born in the Mission at the old, red brick St. Luke's Hospital, and I have been organizing here for twenty years. I attended a great share of movies with my mom. I saw "Butch Cassidy and the Sundance Kid" at the Amazon Theater — which became the Apollo. And I remember seeing Mary Poppins at the Parkside Theater. My favorite adventure, with my parents and sister, was watching scary, PG-rated thrillers at the Embassy Theater on Market Street. I remember the spinning of a lottery wheel on stage and the screams from the audience when their bingo numbers on our tickets hit! The Granada Theater (circa 1960–70 in the Excelsior) was a community, youth center. We'd kiss in the balconies, take out our first dates, and everybody would know who's with whom in the 'hood. The tight, crowded smallness of theater space was a truly genuine form of collective social, class, and ethnic intimacy. You'd kiss and everybody would tell. 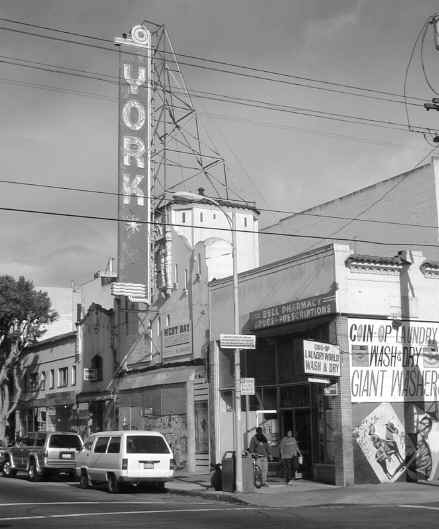 But the most memorable and emotionally wrenching movie experience was always at the York Theater at 24th Street & York. We called it, in the Latino community, the Mexican show, or El Cine Mexicano. Charm popsicle suckers were five cents, and throughout the double feature you'd hear a symphony of babies crying and little kids running up and down the aisles. Every morning when I'd wake up from the night before, I'd remember the antics of the Mexican comic Cantinflas or the romantic, chivalrous, and tender eyes of Pedro Almendariz. It was a time when the Mission was Mexican. Now Brava Theater has taken over, and the sounds of babies crying or Cantinflas's tramp walk aren't even echoes of a period long lost in the city's past. If you print anything I've written — well, please remind newcomers of the sentimental loss of the Geneva Drive-In Theater in the Excelsior, where working families were afforded the manageable cost of piling kids in the station wagon and bringing along all the homemade snacks that stomachs could bear. The loss of the "drive-in" in America is a national cinematic tragedy — working-class, immigrant families really cannot keep up attendance with the prices so outrageously out of reach! Yet the loss of ethnic identity came not only as a result of Chinese, Mexican, & Yiddish film houses closing. Hollywood's mainstream commercial films also produced a "false sense" of cultural & non-ethnic consciousness in the minds of people & children of color in the U.S. I remember when I was five, I wanted to be anything but Mexican. I wanted to be white, blue-eyed, and blond like the kids in the Disney films — The Swiss Family Robinson, etc. Only at the York Theater on Friday & Saturday nights did I see myself on the silver screen (torn corners of the screen were actually taped together with silver masking tape). Only then, never now, did kids from Mexican families laugh and cry when Cantinflas fell or lost the one he loved. Only then did I pride myself on being Mexican — and all that it implies — while we struggled to live in San Francisco. I still go to the movies. I attend the Metreon matinees and I peep at the shows at the Kabuki and the AMC. But for a comparison to the multiplexes — there isn't any. The multiplexes are filled with psychosocial complexes — that is, the complexities that abound in escalators, glass, and cushy, high-back, stiff, stoic, and prefabricated dot.com consumers, white on white. The prices, well, little kids & immigrant families are simply priced out. The end? Or time for a new beginning of cultural resistance in the city? Richard Marquez is an organizer for Mission Agenda and for the Campaign to Elect Chris Daly.